A dark green marble counter and a grid of tiny circular shelves are among the minimal details chosen by Ivy Studio for the Crisp barbershop in Montreal. Located in the city’s Pointe Saint-Charles neighbourhood, Crisp was designed in response to a brief from the owner for a “barbershop unlike all others”. 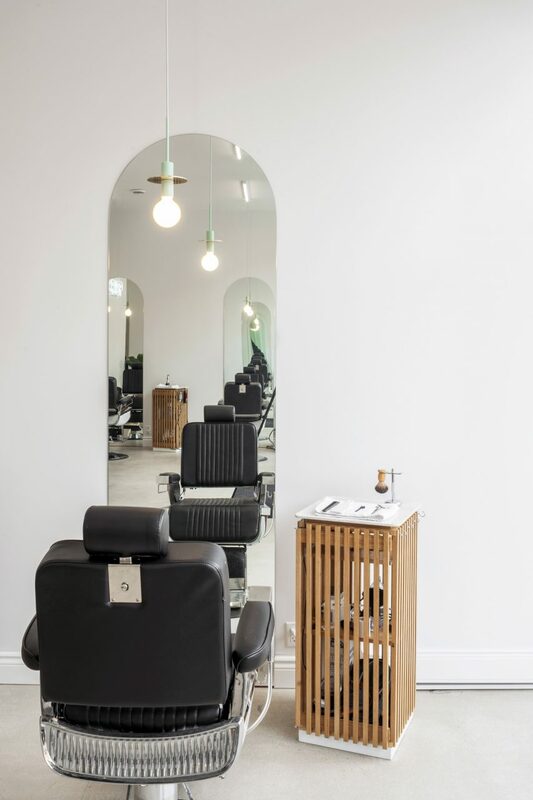 “His ambitions were to create a unique experience in a minimalistic environment that put the spotlight on the barbers and their stations, without compromising on the spaces functionality,” said Ivy Studio, which is based locally. To start with, the designers chose to strip back the space as much as possible. Existing flooring was stripped out to expose rough concrete beneath, while the walls were painted white to to create a neutral backdrop. Grooming stations are arranged along one one wall, featuring tall arched mirrors that run up from the floor. Beside each are slatted white oak chests that Ivy Studio custom made to store the barber’s products.The cabinets can also be moved to open up the space for Crisp to host events. 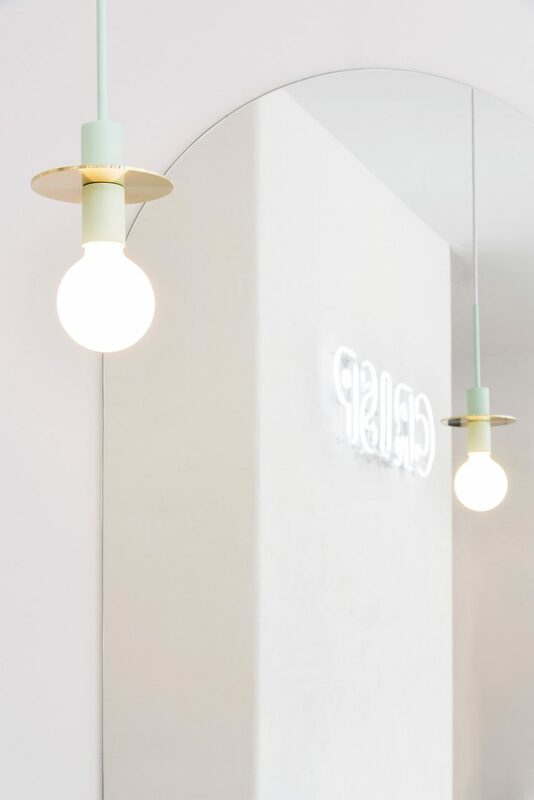 A set of mint-coloured pendant lights hang above each of the customer’s chairs, are intended to subtly pick up on the hues of the dark green marble reception desk at the centre of the salon. Planting provides additional touches of greenery. “This dark green monolithic block acts as a central pillar to the barbers as well as the clients,” said the designers. A wall behind the reception desk provides a screen to the washing stations and storage units at the back of the salon. It is adorned with a neon sign that spells out the name of the salon. A grid of small, round, white shelves decorates one wall, creating space for showcasing products for sale, while wooden benches provide seating for waiting customers. Ivy Studio, formerly known as Obiekt, is led by architects Gabrielle Rousseau and Philip Staszewksi. Among its previous projects is a pared-back interior for a fashion brand in Montreal. The minimally designed Crisp joins a host of paired-back hairdressers completed recently, including a stark white salon in Mexico and a hairdressers in Osaka that can fit just one customer at a time.